Matty is a creative genius when it comes to glue. He and his dad love to make glue creations at home, with mom’s approval of course. But at school, his teacher warns about using too much glue. In class Matty decides to make the biggest glue puddle ever and lay in it. He gets yarn, plastic bricks, goggly eyes, and colorful paper stuck to himself. The problem is that he can’t get up, he’s stuck to the worktable! The more his friends try to release him, the more decorations he gets stuck to himself. Neither the teacher nor the principal can unstick him. Finally, his dad comes in and saves the day. Dad pries him off the table and congratulates him on making a masterpiece. Dad takes him home and unpeels the glue from his body and re-glues it together in the kitchen. They take a magnet and stick it on the back of the Matty-shaped masterpiece and hang it on the refrigerator. Taking the principal’s suggestion seriously, Matty and his parents experiment with tape after dinner… oh no! 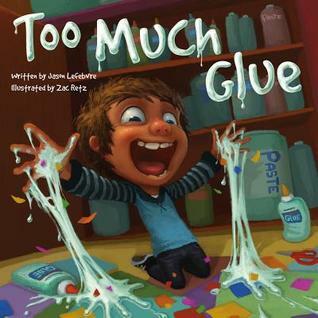 Jason Lefebvre has written his first picture book and glue masterpiece. Although I wonder if he has ever been an art teacher, I bet he was once a kid like Matty! His creativity and over-the-top antics make a hilarious picture book. It’s certainly a story that will ‘stick with you’… ba da dum! Zac Retz captures the spirit of Matty and glue-lovers everywhere. The illustrations are so real, you might be afraid to touch the pages for fear of sticking everything together into one globby glue mess. This is a picture of me with my mother taken last May on Mother’s Day. Many people have said that I look a lot like her. I never really saw that, but in recent years I can see more and more of the similarity. Sometimes I look in the mirror and am startled to see my mother looking back at me! Notice how we’re both squinting into the camera? That’s a bad habit we both have when we’re smiling. Since this picture was taken, my mother’s vision had begun to deteriorate. 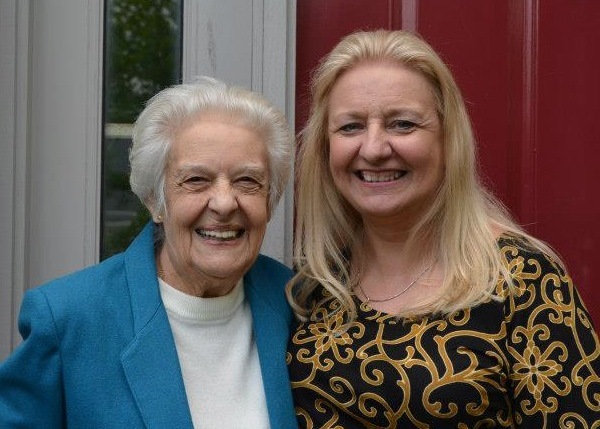 Although she didn’t know it at the time, she’d been developing cataracts in both eyes. She found out this summer when she went to renew her driver’s license. So we spent the better part of the summer having them removed. I’d like to say that I was a perfect daughter throughout the whole process, but I must admit it was more than a little frustrating. First of all, what genius decided that eye drops for cataracts should come in little tiny bottles with even tinier written instructions??? For goodness sake, the woman can’t see! And to make matters worse, there was not one but three different eye drops to take in differing amounts and for differing lengths of time. There was a full page sheet of ovals for her to fill in each time she took one of these drops. So I did what any good teacher would do, I made the necessary accommodations and labeled three large ziplock baggies with the name of the drop and when is should be taken. Then I cut her sheet into strips so that she only had to deal with one week at a time, because of course the directions for each drop changed each of the four weeks that it was administered! And then we repeated the whole process for the second surgery. Throughout all this process, she can’t drive…. so who gets to do all the shopping, library runs, post office delivery, banking, etc…. you guessed it! Ah well, the good news is that now mom has almost perfect vision in both eyes and her driver’s license. I still have my sanity and my mother… life’s good! 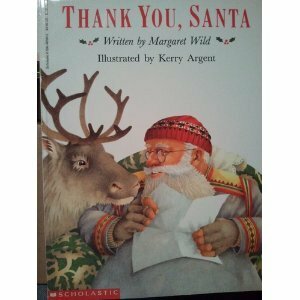 So here’s to all you children out there who are doing your best to help their parents, friends, and neighbors…. Keep up the good work, they appreciate it!